A trip to the woods isn’t complete without a campfire. Midway through Justin Timberlake’s concert on Sunday night, he took a break from playing his pop hits, gathered nine members of his “Tennessee Kids” band, pulled out his acoustic guitar and turned Capital One Arena into a campfire sing-a-long. Timberlake, in one of the many highlights of his “Man of the Woods” tour that’s named after his recent studio album, strummed his guitar while his “Kids” covered classic songs “Dreams” by Fleetwood Mac, “Ex-Factor” by Lauren Hill, “Come Together” by The Beatles” and John Denver’s “Thank God I’m a Country Boy,” while the capacity crowd of more than 20,000 sang with them. At 37, Timberlake is showing no signs of slowing down. He burst onto stardom as part of NSYNC in the 1990s and has gotten better as he’s gotten older. He proved he could be a one-man show in 2002, when his debut album, “Justified,” produced four major hits – “Like I Love You,” Cry Me a River,” “Rock Your Body” and “Señorita.” Four years later, “FutureSex/LoveSounds” was nominated for a Grammy and 2013’s “20/20 Experience” had album sales exceeding 10 million. Timberlake paid homage to his entire body of work in the nation’s capital, where his 26-song, two-hour show combined complex visual technology with all of the hits songs that have made him the planet’s biggest pop superstar. 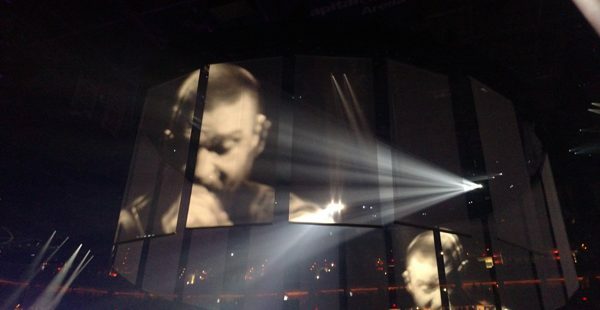 Timberlake’s performance was more spectacle than show. He rarely stopped moving upon opening with “Filthy” and going right into “Midnight Summer Jam,” “LoveStoned” and “SexyBack.” Every song on his list, which “Man of the Woods,” “Higher Higher,” “Señorita,” “Suit & Tie,” “My Love” and “Cry Me a River” within the first hour, were all choreographed differently. 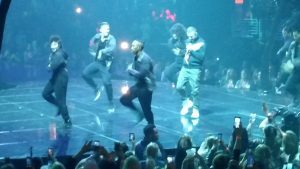 Timberlake’s ability to intricately blend his choreography with hints of Michael Jackson and Prince captivated the audience’s attention on a very crowded stage. Justin Timberlake rarely stopped moving during his concert in Washington, D.C., on Sunday night. He was flanked by his “Tennessee Kids” band that featured singers, two drummers, tuba players, a saxophonist, a trombonist and two keyboardists who blended their sounds seamlessly while they were surrounded by several dancers and huge video screens that turned every song into its own movie. After playing “Mirrors,” “Drink You Away,” and “Until the End of Time,” Timberlake needed to slow it down, which is when he pulled out his acoustic guitar for his campfire sing-a-long. While Capital One Arena is one of the larger venues of its size, Timberlake made it as intimate as he could. He took advantage of a massive stage that included a catwalk that stretched the length of the floor and had a performance area surrounded by a bar for the select fans fortunate to buy a floor ticket. 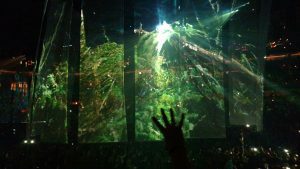 The catwalk, which was decorated with trees and holographic grass in reference to the tour’s namesake, provided Timberlake with an avenue to tour the arena while he belted out every song. At some point, nearly everyone in the arena felt like they were sitting just a few rows away from the stage, even if it was just for a few seconds at a time. The next time The Shadowboxers play Capital One Arena, they might be playing second, not first, as they did on Sunday when they opened for Timberlake. The Shadowboxers, who will release their debut album “Apollo” this week, should turn plenty of heads as the trio continues to open for Timberlake throughout his “Man of the Woods” tour. The group, which includes Scott Tyler, Matt Lipkins and Adam Hoffman, grabbed Timberlake’s attention four years ago by covering his song, “Pusher Love Girl” on YouTube. The crowd gave its best response to the band’s love song, “Timezone” on Sunday night. Jon Gallo is an award-winning journalist and editor with 19 years of experience, including stints as a staff writer at The Washington Post and sports editor at The Baltimore Examiner. He also believes the government should declare federal holidays in honor of the following: the Round of 64 of the NCAA men's basketball tournament; the Friday of the Sweet 16; the Monday after the Super Bowl; and of course, the day after the release of the latest Madden NFL video game. Contact the author.